Worship is a time of fellowship, celebration and learning. Each service centers around the presentation of God’s Word. Our Lead Pastor is Dr. Mark Hartman. Pastor Mark shares the life-changing message of the Bible in a clear, practical and relevant way. Our worship has elements of music, creative arts and technology also used to communicate and inspire. Depending on the service you attend, you will see a choir, orchestra, band or a mix of all three onstage. During times of congregational singing, a worship leader along with a team of singers comes to the front of the stage to lead. Throughout the service, you are welcome to join in or sit back and observe — however you feel most comfortable. The dress is casual and varied so come as you are. Our newest service on Saturday is an opportunity for those who can not attend, while still enjoying all the benefits of Sunday morning services. Both of our Sunday services feature engaging worship, life-changing teaching, and connection through strong, meaningful relationships. In each service, our prayer is that God will be glorified as you experience joy, love, learning, and fellowship. After the service, you can pick up more information about our church and community at the information desks in the foyer. Sunday mornings begin with a traditional service, designed for those who enjoy celebrating through the great hymns of faith. A complete choir and orchestra leads the congregation through popular hymns and choruses of the Christian tradition and heritage. 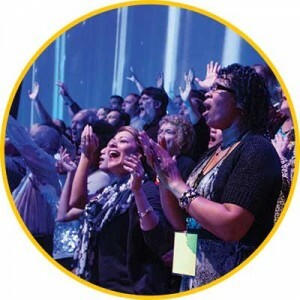 The second service offers a dynamic, contemporary worship experience, blended with modern choruses and hymns. The service is led by a worship team, band, praise choir and orchestra, and also includes dance and dramatic presentations. Our 11:00 worship service is a band driven contemporary experience. We use a multiple worship leader approach where you will hear songs by modern artists such as Hillsong, Jesus Culture, Bethel, and some original tunes. Our last Sunday service is in Spanish. Vibrant music by the Spanish Worship Ministry Team, coupled with a powerful message from Spanish Language Pastor Juan Carlos Heredia, will be the cornerstone of this spiritual time. After Sunday, you can watch our services HERE. “Creek Kids” offers wonderful worship opportunities geared for each child’s age groups. Detailed information can be found here. Besides Sunday morning student classes, middle and high school students can participate in Sunday evening worship at the LYF Center, Sugar Creek’s incredible student center. Check out the LYF student website for more information.